Soon after the publication of these articles, a coincidence at work prompted me to write this post. Allowed input values are limited to 8000 bytes. As soon as we read it, things became very clear to us. Taking a quick look at the schema showed us that the underlying field being checked for changes was an NVARCHAR(MAX) field and the users were attempting to enter data greater than 4000 characters (i.e. 8000 bytes) causing the issue. As long as the data remained less than 4000 characters, no error was encountered. The script below demonstrates the expected behaviour of HASHBYTES given that the input string is less than or equal to the 8000 byte limit. For the sake of brevity, I am using the REPLICATE function to create the string. As can be seen from the example above, HASHBYTES will fail for data beyond the documented 8000 character limit. Hence, areas like free-form comments may not be a suitable candidate for usage of HASHBYTES. Have you ever encountered such a situation before? If yes, what solution did you apply to overcome it? 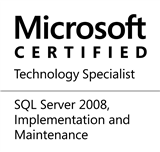 This entry was posted in #SQLServer, Blog, Imported from BeyondRelational and tagged #SQLServer on April 1, 2013 by nakulvachhrajani. but for HASHBYTES if it is eecessary NVARCHAR than split string into multiple parts is better solution. @riks: Thank-you for your comments. The prime difference between VARCHAR and NVARCHAR is that NVARCHAR allows us to store Unicode data. Since our application needs to store Unicode data, NVARCHAR was the data-type of choice. In case the application can use VARCHAR, then you are very correct. HASHBYTES will be able to go upto 8000 characters without encountering an error. The reason is that NVARCHAR occupies 2 bytes as opposed to VARCHAR which occupies only 1 byte of storage space. @Nakul : Thanks for reply. Is application data type specific? can you give some example that this particular app based on unicode data type and other is based on non unicode data type.